...is it bad that this card sees more play than most other Genesis bosses around my locals? Probably. Artemis starts off at 10,000 Power, which is okay at best for a Grade 3, but if you have Twilight Hunter, Artemis in the Soul, which can be done either by riding into it or even Soul Charging it into the Soul, then she permanently becomes 11,000, which is a lot better as the bully columns aren't as effective. As for her Limit Break, when she attacks the Vangaurd, you can Soul Blast 3 to draw 2 cards, put any card from your hand into the Soul and give Artemis an extra 5,000 Power. This is basically a fancier Power Breaker unit like Cocytus, Thunder Break Dragon and Silver Wolf Garmore though it adds a more defensive approach by allowing you to draw more cards by utilizing your Soul. Also, with cards like Chamomile and Melissa currently out, this payment can be a solid benefit as you can Call those units with their effects after you Soul Blast them away. Also, in Set 14, there's even more support coming up with Grappa, but that's another story for another day. Overall, is it better than Iwanagahime or Fortuna? Probably not, but it still can hold up nicely in its own build. I actually have been kicking around with the idea of when to actually review her but it's just a good time never came. Now that we're in the slow period, let's get it out the way. 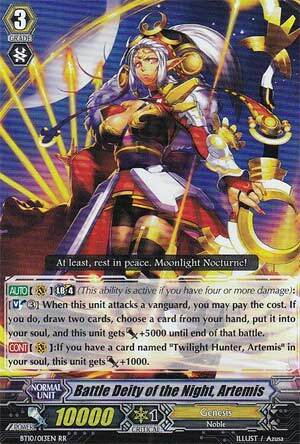 So we have the apex of Genesis's Ride Chain, Battle Deity of the Night, Artemis. Late Game, when she attacks, you Soulblast 3, draw 2 cards, put one card in your hand into the soul, and Artemis gains 5k. At my locals she was pretty popular, but to be honest, I never saw the appeal. She basically embodies what's wrong with English meta Genesis at the moment: It doesn't do anything before Late Game except set up for Late Game. And even then, most of their available gambits have one purpose: extend Late Game for longer. Artemis doesn't even do THAT well at it either. Late Game, you get a +1, but to be honest, her shtick is basically copying Coco except being very slow at it and requiring a lot of external setup beforehand. Moreover, the old school Tsukuyomi build for OTT could get your +1s sooner than Artemis, and also speed through the deck to accomplish a deeper strategy. On the basis that both Coco and Tsukuyomi can do her jobs better, I'd unload Artemis and just use those 2 instead. Sorry.